There’s just so much fun you can have with a saree. From numerous different drapes to novel blouse types, your choices are unlimited. 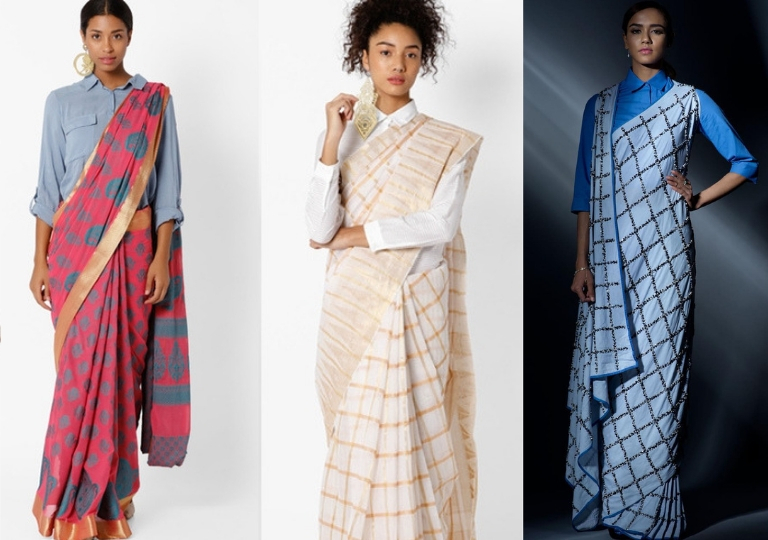 We’d go on to say that a saree can be nearly as versatile a garment as the classic white button-down, if channelized well. You can incorporate it in your everyday wardrobe in a way that’s comfortable, contemporary and chic. 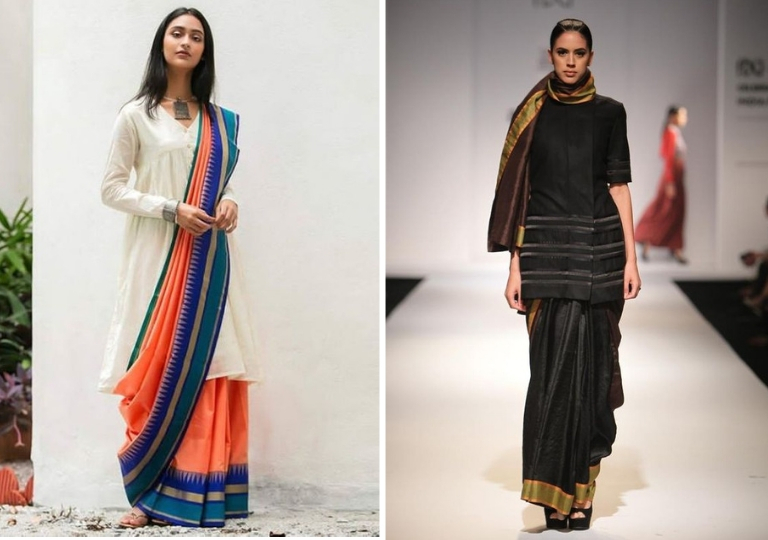 And don’t worry – we’re not going to preach styles you already know of like the dhoti drape or Mumtaz drape. 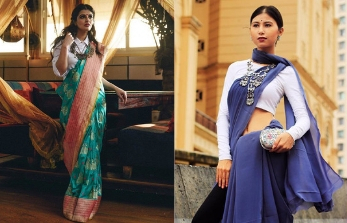 To get some serious edge in your saree, deconstruct it. 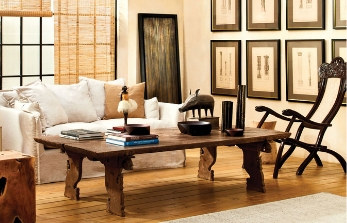 Try these three popular deconstruct styles. 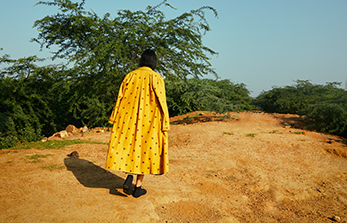 With a tunic | Combine two Indian wear staples by wearing a saree with a side-slit tunic or a sheer kurta (and a stylish bralette under it). 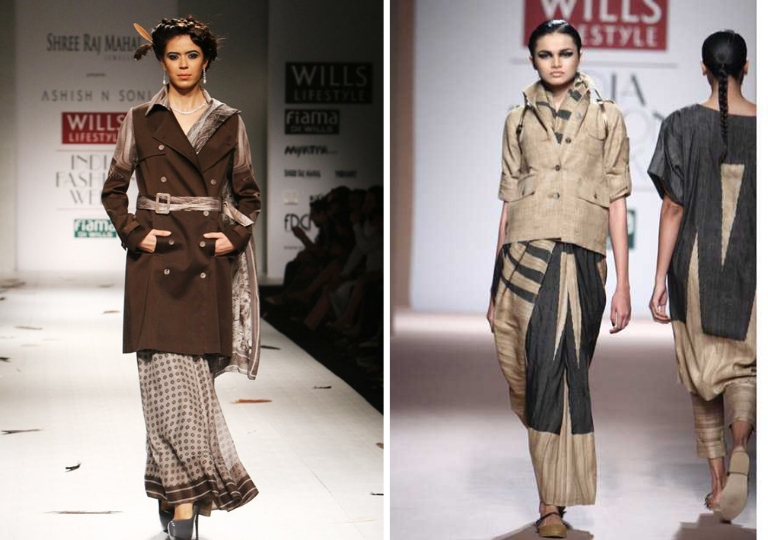 You can experiment with the length of the tunic and with how you wear the pallu – it can go over or under the tunic. 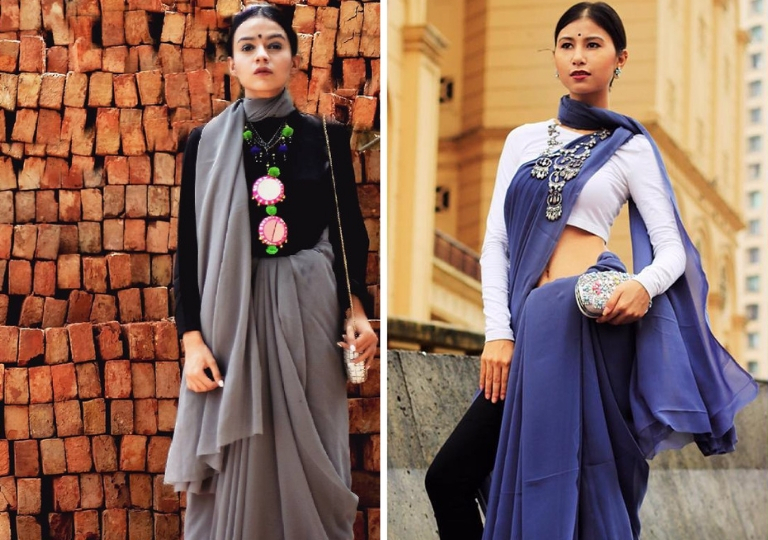 Double cowl drape | Put a top and a pair of tights on, pleat the pallu and place it on your left shoulder letting it fall backwards to a floor-grazing length. Bring the remaining fabric to the front, make pleats of the lower half and tuck them in. Now, work anti-clockwise with the other half – create box pleats and wrap them around your hips creating a cowl. Voila! With a pair of pants | Replace the petticoat with leggings, straight pants, cigarette pants or palazzos and you get a super-contemporary outfit out of the traditional nine yards. 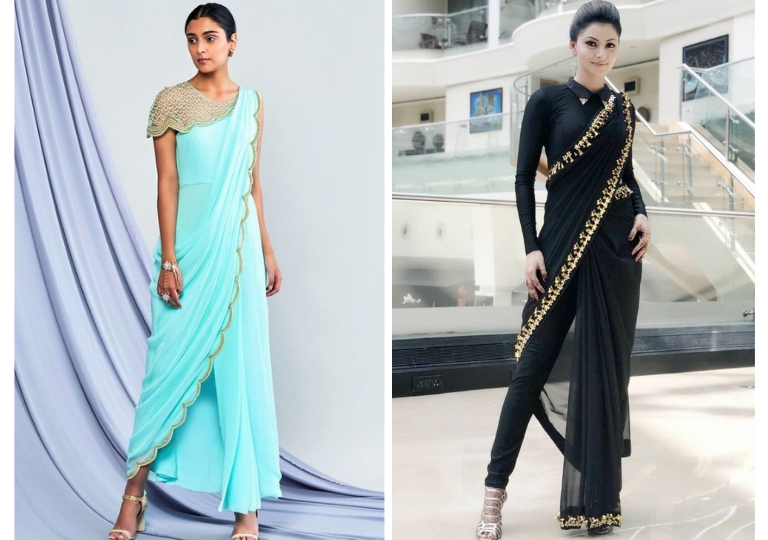 A delightfully easy yet transformational drape, all you need to do to achieve the look is to simply wrap the pallu around your neck instead of pinning it up on the shoulder. Make it even more striking by wearing the saree with a turtleneck blouse or t-shirt and adding a chunky statement necklace to finish. While the international fashion circuits keep playing with contrasting masculine and feminine elements, we give you an all-ethnic way of achieving the trend at home. Borrow from your man’s closet for this one. Wear one of his shirts with a saree and put on a belt or traditional cummerbund on top of it. A very chic combination indeed, as demonstrated by the pictures. 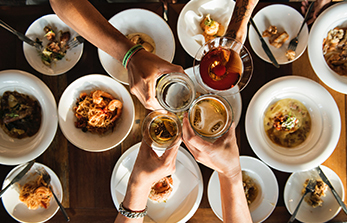 Don it and be the special one at the office party or luncheon with the ladies. Try this look out before winter departs. Wear your nine yards with a trench coat or a khaki military jacket. 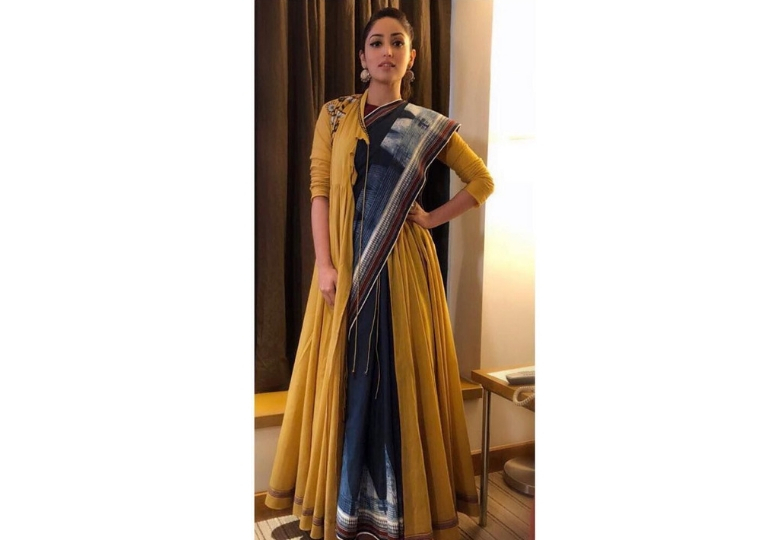 If you like what you see in the picture, achieve Yami Gautam’s look by wearing a graceful anarkali cape over your saree. 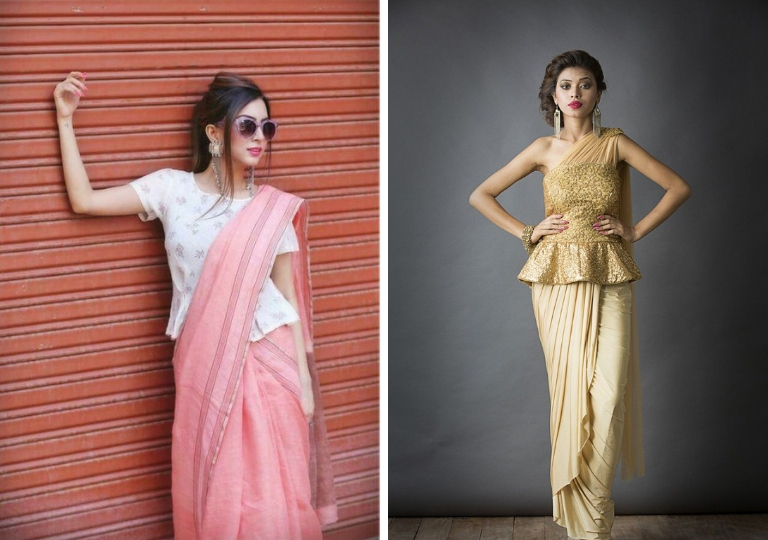 Are your sarees spending long periods of dormancy in the closet in hopes of a special occasion to crop up? Stop waiting and wake them up to these refreshing avatars perfectly suited to your modern urban life. 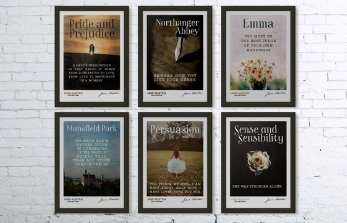 Which one are you most eager to try?